Alvet – suspension is prescribed with a curative and preventive purpose to cattle, horses and sheep with nematodes, trematodes and cestodiasis. 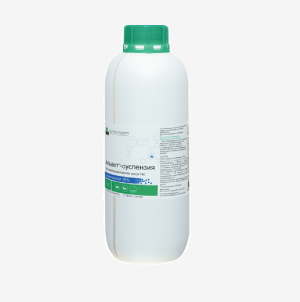 Contains as active ingredient albendazole 10% and auxiliary components (methyl cellulose, propanediol, chloroethon, citric acid, sodium hydroxide and distilled water). It is a liquid from milky white to light gray color. During storage, a stratification that disappears with agitation is allowed. The drug is designed for active immunization of chickens against infectious bronchitis caused by a virus of the Massachusetts type. The drug is administered orally, once. Preliminary hunger diet and the use of laxatives before deworming is not required. For cattle, the drug is administered individually as a 10% suspension for moniesia, pulmonary and gastrointestinal nematodes at a dose of 7.5 ml / 100 kg, with chronic fascioliasis – 10 ml / 100 kg of animal weight, which is 7.5 Mg / kg and 10 mg / kg of albendazole. Horses the drug is administered individually as a 10% suspension in parascaridosis, strongilatose, alfortioriosis, delaphonodiosis, anoplocardial and cyatostomosis, individually at a dose of 7.5 ml / 100 kg of animal weight (7.5 mg / kg albendazole). Before use, the preparation should be shaken thoroughly. Before mass treatments, each series of the drug is pre-tested on a small group of animals (10-15 heads), followed by observation for 3 days. In the absence of complications, the drug is used throughout the livestock. Alvet – the suspension is not allowed to use the exhausted and sick infectious diseases of animals, cows and horses in the first third of pregnancy, sheep – in the first half of pregnancy. It is forbidden to apply the drug to hens. Slaughter of animals for meat is allowed no earlier than: cattle after 14 days, sheep – 10 days. When forced to slaughter previously set deadlines, the meat can be used in fodder for fur animals or for the production of meat and bone meal. Milk of milk animals is forbidden to use for food purposes for 4 days after deworming. Milk can be used after heat treatment in feeding animals. 10% suspension, packed in 1 liter of polymer bottles.